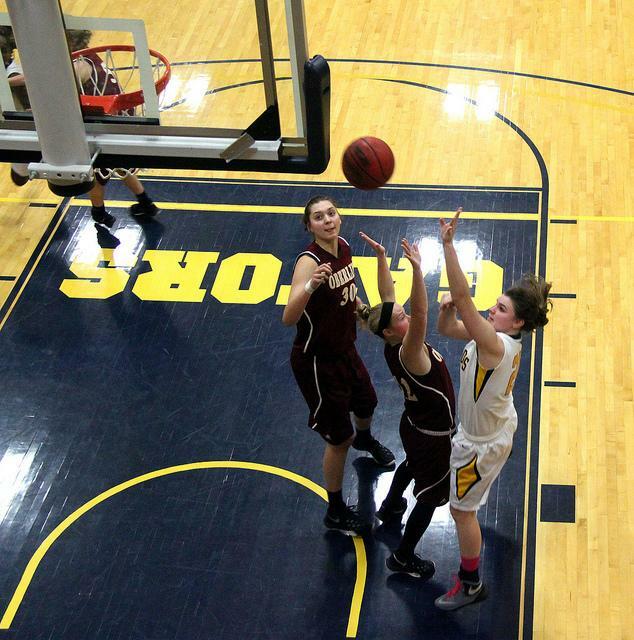 Emma Pellicano, ’16, takes a shot against Oberlin College on Wednesday, Feb. 10, 2016. The Gators finished the game with a winning score of 61-49 against the Yeowomen. The Allegheny women’s basketball team began a two-game win streak as they completed a season sweep of Oberlin College in search of a top-four seed in the conference tournament on Wednesday, Feb. 10 in the NCAC matchup in the David V. Wise Center. The Gators (12-10, 7-6) handed the Yeowomen (10-12, 4-9) their second loss to Allegheny this season as they beat Oberlin College 61-49 and created a two-game edge over Wittenberg University for the fourth seed in the NCAC Tournament. Freshman guard, Delaney Arbore led all scorers with 18 points, while the senior duo of Jessica Mrdjenovich and Emma Pellicano added eight points each. Rachel Vigliotti, ’16, had a game-high five steals against the Yeowomen and contributed seven points offensively. The Gators also forced a season-high 35 turnovers in the victory. 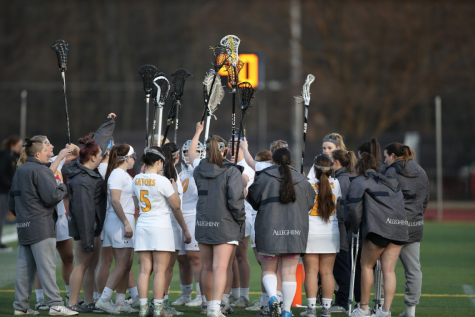 With the win, Head Coach Kate Costanzo believes her Gators can carry their streak into the conference tournament and compete with their competitive NCAC opponents. Amanda Beebe, ’18, said the team needs to work on a few things to keep up their success during the remainder of the season. “We need to work on making shots and staying composed under pressure, as well as executing our plays in order to make a successful run in tournament play,” Beebe said. Madison Caufield, ’18, is coming off a recent knee injury but said her personal goals as well as the team’s goals remain the same on the season. Costanzo believes that the senior leadership on the team has contributed to a lot of the Gator’s success. Mrdjenovich, one of the many senior leaders on the team, has high hopes for the Gators’ as the regular season comes to a close. As a senior, Mrdjenovich knows she’s approaching her last college basketball games in her successful Allegheny career, but that’s not stopping her work ethic. Ifeyinwa Uwazie, ’16, spoke on her senior season coming to a close and what she hopes to see happen for the remainder of the the Gators’ season. “I just try and make the most of every moment I’m on the court and the time I have left with the team. We are definitely working towards winning a conference championship so we need to continue to play well together and for each other,” Uwazie said. Allegheny is back on the road this Saturday, Feb. 13 at 1 p.m. against Ohio Wesleyan to begin their last road trip of the regular season as they try and maintain their position in the NCAC standings.